Although generally considered a beginner's model, the K&E 4053 is actually one of my favourite slide rules. I find it a very functional and aesthetically pleasing rule, especially with all that exposed mahogany wood on the back side. K&E made a number of variants of this model, most notably an 8 inch (4053-2), 10 inch (4053-3), 20 inch (4053-5), and an extended scale 10 inch version with built-in magnifier (4053-3F, for the fine gradations). This model also demonstrates K&E's mind-boggling practice of keeping the same model number despite major modifications over half a century of production. What I have done on this page is to try and present a chronology of changes in the standard 4053 model over its design run, based on samples in my collection. 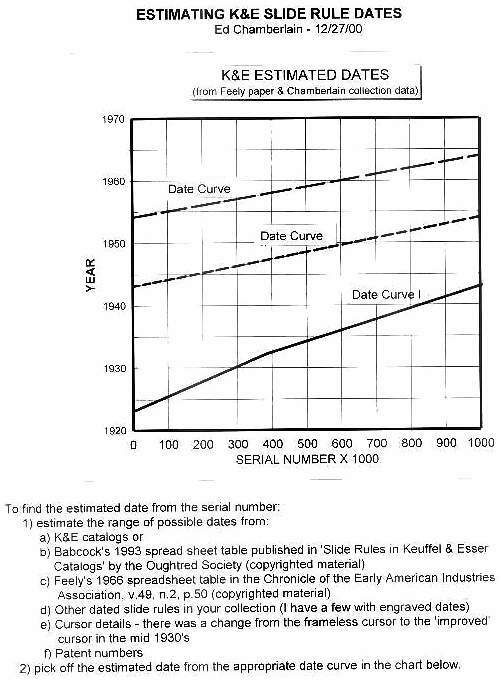 Additional dating information has been obtained from a variety of sources, with special thanks to Ed Chamberlain for his excellent set of K&E dating curves based on K&E serial numbers. A big thanks to Clark McCoy as well, for all the various K&E catalogs he supplied (you can check out Clark's K&E catalog collection at his new website www.mccoys-kecatalogs.com). You can also check out his 4053 page for some additional rules not covered here. I've organized this page by presenting the rules chronologically, with an approximate date followed by date ranges in brackets indicating when I think a particular model was in production. These dates are only estimates, and are bound to be revised as I get new models in and learn more about this company's arcane design modifications. I've also listed the mating/serial number for each rule shown in the illustrations, as well as the numbers for any additional rules in my collection that match the same class. Please stay tuned for updates! According to Peter Hopp, production on the 4053 series didn't begin until 1909, although later models show a 1900 patent date on the stator. There may be an even earlier model, as the 1909 K&E catalog shows a diagram of this rule without a model number identification label and with the scale labels on the left side. However, K&E wasn't always accurate in the location of their scale labels (see below), and there is no mention of this rule in the 1906 catalog. By the 1913 catalog, this rule is clearly identified as the one shown above, although the scale labels are still drawn on the wrong side. Like all later 4053-3's, this rule has an inch ruler along the slanted edge and a table of conversions on the back. In this case, the conversion table seems to reflect the age of steam engines. It has A,B,C,CI,D scales on the top, S,L,T on the back of the slider, and a cubic K scale (unlabelled) on the hard edge. This interesting location of the cube scale required the use of a translating "chisel" cursor to relate the cursor hairline to side edge. Also note the thick, heavy metal look to the cursor, representative of this original model. On the left edge of the rule stator and slider are engraved 3-digit numbers used to match parts during production. These so-called "mating" numbers were one of K&E's many innovations, helping to insure accuracy by matching sliders and stators engraved by the same machine (and thus having similar wear patterns). The case consists of two parts, made of some type of hard cardboard with a sliding cover, and has generally stood up well except for the loose end pieces that now let the slide rule slide right out! Given its considerable age, it's remarkable the excellent shape this specimen is in - far better than many of the more recent 4053's I've seen. Incidentally, according to the 1909-1915 catalogs, this rule apparently retailed for $5.00. Update: Thanks to Clark McCoy, I now have a confirmed sighting of two earlier models (ca. 1909?) that are simply labeled < 4053 > on the slider. Check out Clark's 4053 page for more details. This slide rule looks almost identical to the one presented above, except for the new frameless cursor design. Dating this rule is a little problematic, since the most common form of this cursor is glass on plastic with a 1915 patent pending date (see example below). This one, however, is glass on metal with no date, suggesting some sort of early intermediate cursor. The 1915 and 1921 K&E catalogs unfortunately don't specify the material used for the cursor, but this rule looks identical to the ones pictured there (still with the scale labels on the wrong side). Unfortunately there's a small chip in the glass on the bottom left of this particular cursor - so much for the "improved" frameless design! Because the slide rule itself is unchanged, it also needs a translating cursor point for the cubic scale, which can be seen on the high resolution edge picture. Unfortunately, this rule lacks its case, although I suspect it would look similar to the other ones shown for this general time period. Definitely a very rare member of this species given the undated metal cursor! Virtually identical to the model presented above, with one slight modification of the frameless cursor design - the end pieces are now plastic instead of metal and list a 8-17-15 patent pending date. It has exactly the same shape, however, and retains the translating side cursor mark. The lack of serial/part numbers places this rule before 1922, since that is when K&E apparently first introduced the practice, according to Ed Chamberlain. The conversion tables on the back are almost identical except for an additional separating line underneath the Imperial and Metric tonnes. However, I've seen (presumably older) rules with this cursor but the same table of contents as the model above. As previously mentioned, the 1915 and 1921 K&E catalogs show identical illustrations, making it difficult to fix an exact date but it is clearly within that range. The case is in excellent condition, and is similar to the hard cardboard case presented with the first slide rule on this page. I also have an identical version of this rule with the high quality all-stitched brown leather case, but it is missing part of the closing flap (see below for the example of the case). As for price, the MSRP was still $5 in 1915, but unfortunately no value is listed in the 1921 catalog. By 1922, however, the rule was up to $6.25 ... there's inflation for you. A thorough re-design of the venerable 4053 series, earning the added N designation ("New"). The most obvious change to the rule is the re-positioning of the cubic K scale onto the bottom of the stator (although it looks a little squeezed in there, doesn't it?). This rearrangement allowed the addition of a centimeter ruler scale on the recently vacated hard edge (see edge scan). Note that the scale labels have moved to the left side of the rule, finally bringing it in line with the catalog illustrations. Accordingly, the model number is now on the right side (with the "N" located outside the bracket), and the company info has moved to the top (still with that June 5, 1900 stator patent date). This cursor is a modification of the frameless glass on plastic presented above, but is lacking the now-redundant translating side cursor line and corresponding indentation (it still shares the same patent pending date of 8-17-15, however). The earliest K&E catalog copy that I have seen that shows this new design is 1922 (although it lacks the N label ... see the rule below for a discussion). Similarly, this rule has parts/serial numbers engraved on the celluloid, although the serial number is only five digits long instead of the typical six found on all later rules. These were designed to replace the older mating numbers, and can now be used to successfully date the age of the rules. Interestingly, this rule still has the older engraved mating numbers as well, indicating there was some period of overlap in the transition to a unified numbering system. The table of conversions on the back is unchanged from the previous model. The black case is made of a hard particle-board like material, but with a snap closure imprinted with the words K&E POLYPHASE SLIDE RULE in gold lettering. Although heavily damaged and covered in various kinds of tape, it doesn't appear to carry the specific rule model number, as was commonly seen on later versions of this style case. This rule is unchanged from the model above, except in one particular: the edge mating numbers are now gone. As illustrated by the serial number, it was presumably manufactured very shortly after the specimen shown above, indicating that the overlap with the older part-matching system was short-lived. The case that came with this rule is the early high-end K&E sewed leather model with the stitched closing flap (unfortunately partly ripped in this case), and hand-dated to 1925. Unfortunately, it is the wrong case for this rule as it is labelled 4041-3S (the 4041 was a similar rule but with a simpler scale arrangement). Nevertheless, I've included it here since it would have been possible to obtain this type of case for this rule at the time. Although this scale arrangement (and N designation) is believed to have begun in 1922, it is difficult to get reliable information on this period. The N label is not shown in the catalog illustrations for 1922, 1925, 1927 or 1930, although it is referred to in the text of the 1925 catalog onward. The earliest polyphase manual I've seen with this scale arrangement is copyrighted 1925, and shows the same image from the catalog of that year lacking the N label on the illustration but describing it in the text (see the entry below for a cover scan of the manual). Also, note that the N is written outside the model number brackets on this rule, whereas it is always included inside the brackets on later models (see below for comparisons). Interestingly, in the copyright 1929 book "The Slide Rule" by E.R. Breslich and C.A. Stone (University of Chicago Press), a variety of official K&E illustrations are used, several of which include the N label. Although it doesn't show a 4053, one illustration of a similar rule includes it outside the brackets as seen on this rule ("N <4133>"), while another shows the N within the brackets ("< N4041 >"). The N4133 illustration is the same as that from the 1925 and later K&E catalogs, but the N4041 was still being shown with no label at all as of the 1930 catalog. Odd that they would have had the image prepared by 1929 and not use it until later in their own publications (it does show up in the 1936 catalog). I guess updating their own illustrations in a consistent or timely manner was not of prime concern to them during this time period. In any case, this revised rule was clearly in production as of 1922, based on the catalog design illustrations and serial numbers, despite the lag in labeling in various K&E listings. Although superficially similar to the 1923 model shown above, a couple of significant changes evidently took place in a very short period of time. The most obvious cosmetic change is the inclusion of the "N" label within the model number brackets on the face of the slider. This style printing design persisted from this point on, with the exception of the smaller 8-inch 4053-3 models (see below for an example). The major change takes place on the reverse of the slider, where the log scale is now labelled as such ("L"), and runs in the reverse direction. The range is also now labelled as 0 to 10 log units instead of the previous 1 to 9. The table of contents on the back remains unchanged from the previous model. The case is the high-end leather model with a stitched closing flap (unfortunately, if not uncommonly, missing in this case). All in all, more an incremental change than a model redesign, but it shows the rapid pace of development during this era. Unlike all the 10-inch 4053-3's on this page, this a rare example of an early 8-inch model, known as the 4053-2. This rule dates to 1926 on the basis of its six digit serial number, and reveals further minor changes that this series underwent in the 1920s. On the face of the slide rule, the N is located on a separate line above the model number brackets (apparently, this was common on the smaller N4053-2s). The cursor is virtually identical to the previous model, only now (and from this point on) the 8-17-15 patent date is labelled on the bottom piece instead of the top. Interestingly, the centimeter scale, which runs only to 20 in this case, now lacks the "0" mark at the beginning, perhaps due to the longer 6-digit serial number getting in the way. Oddly enough, however, the "0" makes a brief return to this scale around 1940, and then disappears again! (see lower down this page for further examples). But perhaps the biggest change with this rule is the more modern table of equivalents and abbreviations on the back, courtesy of the U.S. National Bureau of Standards Circular no. 47. Unfortunately, the K&E catalogs from this time period are not very helpful, since the illustrations didn't change until after 1930, and no additional information is given for the conversion tables. The case is the high quality all leather version, with fully stitched closing flaps and chamois interior (still in very nice shape, I must say). A great little rule that has held up very well over the years. I was hoping to more accurately date the change in the table of contents on the basis of when the U.S. National Bureau of Standards published that circular. However, according to the records I've found for NBS publications, Circular no. 47 (C47 - "Units of weight and measure - definitions and tables of equivalents") was published in 1914. So that's not much help for us, since K&E only started using it sometime in the 1920's. Incidentally, it was superseded by NBS's Miscellaneous Publication no. 121 (M121 - "Units of weight and measure (United States customary and metric) definitions and tables of equivalents") in 1936, even though K&E kept its table basically unchanged well into the 1950's. For those of you who are interested, it seems the NBS was hard at work during this time period helping to safeguard the American public with their other vital documents, such as C64 ("Rules and regulations for enforcement of lime-barrel act", 1917) and M149 ( "A basis for a performance specification for women's full-fashioned silk hosiery", 1935). Your U.S. tax dollars hard at work! Virtually identical to the earlier models above, the only difference I've detected is the slightly larger font used for the identification labels, suggesting they re-tooled at some point around this time. However, all scales and font types are unchanged from the previous models. The cursor assembly is also unchanged, and also has the patent date on the bottom. The back of the rule has the full version of the modern table of equivalents and abbreviations similar to model above. The six-digit serial number places this rule to about 1928, which fits in well in this chronology. I don't have the case for this rule, but I doubt it would be very revealing. The manual shown above didn't actually come with this rule, but it is the appropriate version for this model. It has a copyright date of 1925, and it seems to have been sold with the rule well into the late 1930s. According to the K&E 1928 catalog price list, this model was still sold for $6.25 with the plain case, but $7.10 in leather. Check out the rule down below for yet another example of how quickly things change in this family! This rule is going to require a little explaining, as you may wonder why exactly I've placed it here in the series given its apparently later design cursor. Part of the reason for this is that the body of this rule is clearly intermediate to the ca. 1928 and 1930 models shown above and below. Basically, the face of the rule is completely unchanged from the ca. 1928 model, but the font for the labels on the reverse of the slider has changed to a sans serif style, like the identification labels. The back of the rule is otherwise unchanged. As for the cursor ... this is where it gets interesting! Superficially, it looks like the standard "improved" 1937 patent date cursor (see below). However, if you examine the edge or back scans, you'll see this cursor has the translating cursor mark for the cubic K scale! Remember, the cubic scale moved to the face of the rule by 1922 (see the earlier rules). This leads to me to suspect that this is in fact a replacement cursor, manufactured sometime after 1937, to be used for all the older 4053 models including those that needed a translating mark. I always suspected K&E must have made something of the sort, given how easily the cursor slides right off the rule ... I had just never seen one before. The appropriate cursor for this model is no doubt the standard frameless one shown above and below. My estimated date of 1929 also fits perfectly for the serial number on this particular specimen. The case is the late-model green form-fitting synthetic type with bolted-on leather case closing flap, and is undoubtedly of more recent origin. I've never seen this style of case with rules made before the late 1950's at the earliest (it's identical to ca. 1960 model shown at the bottom of the page). Interestingly, someone else with the same family name has crudely labelled the inside of the case with a marker ... father passed along to son, perhaps? That might explain the replacement parts from a later era. An interesting puzzle. Once again, only small changes differentiate this rule from the ca. 1929 model. On the body of the rule, there is now the complete switch to the sans serif font for all the scale and identification labels (finally!). The cursor is unchanged from the early models. Naturally, it also has the more modern table of contents on the back. Both the rule and cursor on this model are in pristine condition, with the original luster and beautiful white patina of the celluloid. Dating should be reasonably straightforward, since according to the K&E catalogs the 1930 model still had the old fonts and the 1936 model had the new improved cursor design. However, the original owner kindly inscribed the date 12-4-30 inside the high quality leather case that came with the rule! That also fits with the serial number on this particular rule, which would place it circa 1931. Thus, I feel fairly confident with this rule's date, and must assume (once again) that K&E was a little slow in updating its catalog illustrations. The leather case is still in excellent shape, if a bit weathered on the exterior, and features the early stitched-on type of closing flap. I've also included a scan of the standard K&E instruction sheet that came with it on how to adjust this model rule. The 1930 K&E catalog lists the price for this model as unchanged over the past decade ... a bit surprising that given the high inflation levels known to exist immediately prior to the Great Depression. In any case, a gorgeous specimen of this early model rule, from a highly dynamic period in its design cycle. What a unusual intermediate! The body of this rule is unchanged from its immediate precursor shown above, but the cursor has undergone yet another modification of the old frameless design with a much bulkier and, frankly, less substantial feel. Apparently, they tried to reduce the incidence of corner "chipping" of the cursor (a common problem) by building up the plastic end pieces in these areas. Amazingly, it still sports the same 8-17-15 patent pending date on the bottom! I don't have a catalog showing this model cursor, but the 1936 K&E catalog clearly shows the new body design and improved cursor presented below. I would have thought this rule was from no later than 1931, however, since the very different 1934 model rule show below has a stator patent date of 1931 and this one still has the original 1900 date. But it is still presumably newer than the 1930 rule pictured above. According to the serial number, I'd have to estimate it is from somewhere around 1931-1932. As such, I'm going to tentatively label this rule as from 1931, but your guess is as good as mine! The case is made out of a hard textured particle/cardboard-like material, with a hinged leather closing flap glued on. As for cost, I don't know what the US list price was in the early 30's, but I've seen an identical rule with a Canadian price of $8.65 CDN listed on the box. Finally ... the first version of this rule with the vastly improved metal-framed cursor. I just can't say enough for this cursor design - K&E finally hit on a winning combination. Although most versions of this cursor feature a 1937 patent number, this "patent pending" model cursor (see slanted edge scan) demonstrates that this design innovation was probably in place at least a couple of years earlier. The body of this rule is completely identical to the specimen above, with only the improved cursor to distinguish them. Although this type of cursor is first shown in the illustrations of the 1936 K&E catalog, I suspect K&E was slow in updating its illustrations, and this cursor is indeed original to this 1933 rule. In support of this conclusion, you'll notice the 1934 slide rule presented below that has the same "patent pending" cursor but an updated body style. Interestingly, the 1934 catalog still shows both the old cursor and slide rule design, while the 1936 catalog correctly illustrates both the new cursor and new body design shown below. Incidentally, I also have a ca. 1935 model K&E 4091 with the corresponding duplex version of this cursor stamped "patent pending", confirming that this style cursor was in use prior for several years prior to the incorporation on the 1937 patent date. Check out the 1934 specimen below for an example of the updated body identification labels. The case for this rule is the fairly common hard particle-board type with button-style closing flap, crudely repaired as these cases often are (see below for another example of the same case). With the discovery of an earlier rule with a "patent pending" improved cursor style (shown previously), the evolution of this model becomes a bit clearer. This rule (also with the "patent pending" cursor) is not appreciably different from the 1933 model in any meaningful way, except that the stator now has a patent date placing it at 1931 instead of the old 1900 patent indicator. Odd that it took them a few years to add the new patent number, but as you can see from the evolution on this page, things had changed quite a bit from the original model. The case is also of the the hard particle-board type version, with a push-button closing flap. In a nice touch, the rule's bona fides are stamped in gold lettering on the flap (notice that it still says simply 4053-3). A not uncommon version of the case from this time period, and another example with multiple botched repairs common to this model. A very unusual intermediate rule! Although very similar to the model shown above, there are a few interesting modifications. First, the cursor now has that standard 1937 patent number (which is seen on these rules from this time forward). Secondly, the log scale on the reverse of the slider now goes from zero to one (in decimal units), instead of from zero to 10 (marked by integers), as shown on earlier rules. The strangest change, however, is the re-adoption of the "0" mark on the centimeter ruler edge. I have not seen this mark on any other rule from this time period, and it was definitely gone again by the 1942 model shown below. A very bizarre (and short-lived) re-tooling obviously occurred around this time. In any case, the patina of this particular specimen is still incredibly white for its age, and everything is in excellent shape. The case is the high-end sewed orange leather type with chamois interior, although now with the closing flap bolted on instead of stitched (with a patent date of 1935 on the metal end pieces). As for cost, I know from the 1937 K&E catalog price list that this model was now up to $7.00 in the plain case, and $7.80 in leather. An unusual example of the latter type N4053-3, sporting the best cursor design and highest quality case. Along with its close cousin down below, this general style of rule is probably the most common type you will find. In fact, aside from the cosmetic K&E logo added in the late 1940s, this rule appears to have remained relatively unchanged for over a decade. Basically, the body and cursor of this rule are unchanged from the previous model, except for the now permanent removal of the short-lived resurgence of the "0" mark on the centimeter scale. The case for this particular rule is a rather beat-up and mottled high-end leather design with a bolted-on closing flap, although a variety of case styles were available in this period. It appears the 4053-3 had entered a period of quiet respectability for next few years! This rule differs from the previous version in the location of the identification labels (including the model number), and now sports the K&E logo on the front right-end of the slider. K&E also dropped the "N.Y." reference after its name on all labels, including cursors, somewhere around this time. Dating this largely cosmetic switch has proven quite interesting. Based on all the K&E rules in my collection, the switch appears to have occurred between 1946 and 1949. As usual, the K&E catalog illustrations seem to be a bit behind, as all issues from 1936-1952 show the previous appearance (it isn't until 1954 that the revised labeling procedure is represented). The manual that came with this rule has both a 1938 and 1944 copyright date, and thus also shows the previous model illustration. I've obtained a second copy of the manual with the alternate-design cover, but it contains the same content, illustrations, and copyright dates as the older looking manual. Although the serial numbers of the various rules of this type in my collection all date to about 1949-1950, I now have a confirmed sighting of this model rule with a 1947 serial number (367497), matched to a family history of use. I've also seen the earlier design rule shown above with a slightly earlier serial number (356802), giving us a pretty tight range for the switch in label styles (i.e. 1947). The case shown for this particular rule is the new standard version, made out of a synthetic form-fitting black material with leather closing flaps bolted on. One of the 1950 rules in my collection has an unusual case variant, intermediate to the leather/button style closing flap of the hard composite case (shown in its own scan here). All in all, I'd have to say that this is probably my favourite version of the rule, although this particular specimen needs a cleaning, which I haven't gotten around to yet. Incidentally, according to the July 1, 1947 K&E price list, this rule was retailing for $11.00 with this case, and $12.75 with the high-end all leather model. However, by the October 15, 1949 price list, the leather model was retailing for $14.00 while the base model was unchanged ... was there a run on cows in this time period or something? Talk about a major design change! Supposedly, production ceased on the 4053 series under that model number by 1956, but before that happened it underwent a major overhaul. Incidentally, they seemed to have dropped the N reference label with this new design. The integral mahogany nature of the rule has been replaced by celluloid-coated mahogany attached to a plastic base. This greatly reduces the weight of the rule, and allows the new simplified conversion tables to be directly printed on the back (neither of which is an improvement, to my mind). The serial number is present only on the slider, but presumably they still had some way of matching up parts. The plastic base is clearly of inferior quality to the celluloid laminate, although you won't be able to tell on the scans. Due to the new arrangement, both the centimeter and inch rulers now project directly outwards, which I must admit is convenient. The "improved" cursor has been slimmed down, and the end pieces seem to be made out of cheaper plastic, but it follows the same basic design as the previous models (I don't know if I would agree with the adjective "unbreakable" used in the catalogs!). They have also added little plastic stop-gaps at the edges on the lower wooden cursor groove to prevent the cursor from sliding off (a clever idea, finally). The striking green case with leather closing flap is in essence no different from the older standard synthetic black models, and this one is in near mint condition (not to mention gorgeous)! The patent number on the case still dates it to 1935, proving that K&E could keep its hands off a good design, on occasion. This rule also came in the original hard green cardboard box with a modified version of the instruction booklet on how to take care of your slide rule (new final copyright date of 1953). In terms of changes to the booklet, all they have done is dropped the instruction page for adjusting the cursor (I guess they were afraid you might break their new "unbreakable" design), and they no longer care about the order in which you adjust the tightening screws on the back. The illustrations shown in the 1954 and 1955 K&E catalogs are identical, and correspond exactly to this rule. However, the slide rule serial number would seem to date it closer to 1956, so I'm going with that date. I don't have a catalog price list for this year, but according to Michael O'Leary's K&E catalog cross-reference, this rule was retailing for $13.50 in the synthetic case and $16.50 in the leather model as of February 1st, 1954. That would seem to fit with the hand-written price tag of $13.50 clearly visible on the exterior box label for this rule. The manual featured above actually comes from an identical 4053-3 in my collection (serial number placing it to ca. 1955), and features a final copyright date of 1954. Overall still an attractive rule, but lacking some of the charm and warmth of its predecessors. Incidentally, there is considerable variation in the degree of rounding of the corners of the plastic base piece on these models. Unfortunately, this seems to represent variations in K&E quality control, and is not useful for dating the rules (alas!). This near-mint specimen is virtually identical to final version of the 4053 presented above. It seems to fall under the final K&E 68 series numbering scheme, but I'm not sure when exactly its production really began under this new label. The only difference to the rule is the new model number on the face. The serial number helps to date it somewhere around 1958-1959. Interestingly, the manual that came with this model has the same final copyright date (1954) and is virtually identical to the one above. The only differences are that it now refers on the cover to product number 68 2063, or old model 4187H, and the otherwise accurate illustration of the rule inside the manual lacks any reference to any model number whatsoever (the older manual above clearly shows the 4053-3 label on the face of the rule). Apparently, K&E switched to making generic versions of its manuals at the time of its re-numbering, and assigned them individual product numbers distinct from the slide rules they represented (naturally, these manual numbers are completely arbitrary!). The case with this rule is identical to the standard synthetic green leather case shown above, but according to the 1962 and 1967 K&E catalogs, the 68 1617 came with the high-end sewed leather case while the identical model 68 1622 came with the synthetic leather case actually shown here. Incidentally, Peter Hopp's book describes this model as a military slide rule, although there's no mention of that in the manual or the catalogs I have from this time period. Maybe it's just me, but I get the feeling that K&E was just a tad confused around this time! As for cost, according to the August 27, 1962, K&E price list, the 68 1622 sold for $17.50 while the 68 1617 (with the leather case) sold for $20.50. Also, the corresponding 68 2063 manual sold for $1, separately. Interestingly, according to Wayne Feely's article in the Chronicle of EAIA (June, 1969, v52 #2), K&E sold 2,811 units of the 68 1622 model in 1967, for total sales of $43,424, or approximately $15.45 per rule ... I'm guessing this was the wholesale price, not retail. In any case, this version of the rule was presumably made right up toward the end of K&E's slide rule production run, although the 1972 catalog shows an entry only for the pocket model of this rule (model 68 1643). Anyway, I have included it here as the final version that I am aware of for this classic slide rule. It certainly came a long way! All material © 1999, 2002 by Eric Marcotte, Ph.D.